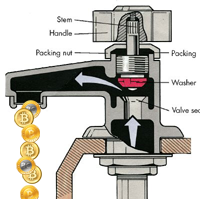 Due to recent price fluctuations and transaction fees, the Bong-Bitcoin Bong Faucet is down for the foreseeable future. I haven't looked into faucets in a while, but I'm sure most are not in operation anymore. The main reasons I would assume would be the high fees just to transfer dust across the chain. I will be keeping the faucet list and past information below available for posterity. Some faucets use the inputs.io or CoinBox.me wallet to store your Bitcoins until you decide to transfer them to your wallet. This is to be able to make microtransactions after the 5430 restriction without spamming the blockchain. Inputs.io was "hacked" and "lost" 4,100 BTC... It won't be coming back. Many of the inputs faucets below will be down but some of those faucets are switching to other payment systems so check those from time to time. Ones that switch over will be noted here. I'll be putting other cryptocurrency faucets here too, or at least until each currency has a good number of sites to get a separate page. If the dispense column range is 0, I either don't have the information for it or it's not a typical faucet. Here are the faucets! BitcoinCasino - Get absolutely $31 FREE to play at Uptown Aces. If you win with your free chip, you may withdraw by Bitcoin. FreeBitcoin - Win up to 0.225 BTC every hour! FreeBitcoinwin - Win up to 0.225 BTC every hour! LTC4YOU - Win up to 50 uLTC every hour, and more with referrals! QoinPro - Not quite a faucet but a continuous source of Bitcoin, Litecoin, Feathercoin, and Fedoracoin with an extensive referral matrix! For more info, see Bitcoin Units. **Try it at someone else's home.